Thai red curry paste, garlic, ginger, cilantro and fish sauce flavor the coconut-infused broth for these braised bison short ribs. 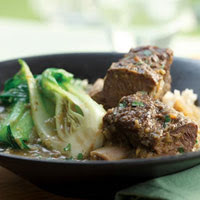 A tough cut of meat, the short ribs become meltingly tender when cooked slowly over low heat. Bison short ribs, unlike beef short ribs, are quite lean and therefore can be enjoyed as part of a healthy diet. If you have time, prepare this dish through Step 2 a day ahead - the flavor of the sauce and tenderness of the meat get even better overnight. Serve with bowls of jasmine rice. Tip: Bison short ribs can be found at specialty meat markets and online. For bone-in short ribs, both English-style - a single bone with a chunk of meat attached - and flanken-style - thinner cut with 3 to 4 ribs per strip - will work for this recipe. Remove any silver skin - the tough, silvery-looking membrane lining the meat-side of the ribs - before cooking. Calories 211, Total Fat 4 g, Saturated Fat 1 g, Monounsaturated Fat 2 g, Cholesterol 79 mg, Sodium 759 mg, Carbohydrate 12 g, Fiber 3 g, Protein 31 g, Potassium 781 mg. Daily Values: Vitamin A 70%, Vitamin C 80%, Iron 25%. Exchanges: Vegetable 1.5,Lean Meat 3.5. This entry was posted on 4:47 AM and is filed under Meat and Game . You can follow any responses to this entry through the RSS 2.0 feed. You can leave a response, or trackback from your own site.